Back in the room after dinner and wanted to post a few images from today. This is the first time that I have taken my laptop on one of these “adventure” trips and, with David to sort out the technical issues, I’m able to blog, check email and follow the news for the first time. Tomorrow afternoon we go out to Hustai National Park, about two hours from UB. Then we’ll have three days to watch the takhi (Przewalski’s Horse) and tour around the area. Although there will be electricity available in the gers, there is no internet connection. In fact, the park has no phone, but uses a radio to communicate. We walked up to the Nomadic Journeys office this morning and got some trip details sorted out, then went to Le Bistro Francais for lunch. Chicken in white sauce and Mongol beer for two. 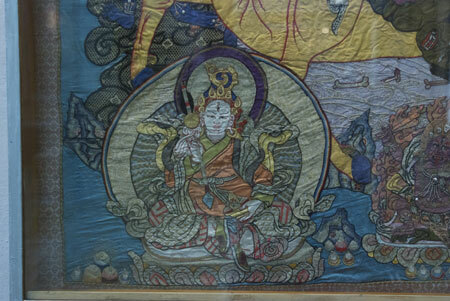 Afterwards, we walked over to the Zanabazar Art Museum, which had been closed my last trip. Zanabazar was a Buddhist monk who created extremely fine bronze sculptures of Buddhist manifestations like White Tara and Manjushri. He is a national hero to the Mongolians. Unfortunately, the sculptures are under glass and I couldn’t get decent photos, but there are some on the museum website http://www.zanabazarmuseum.org/. 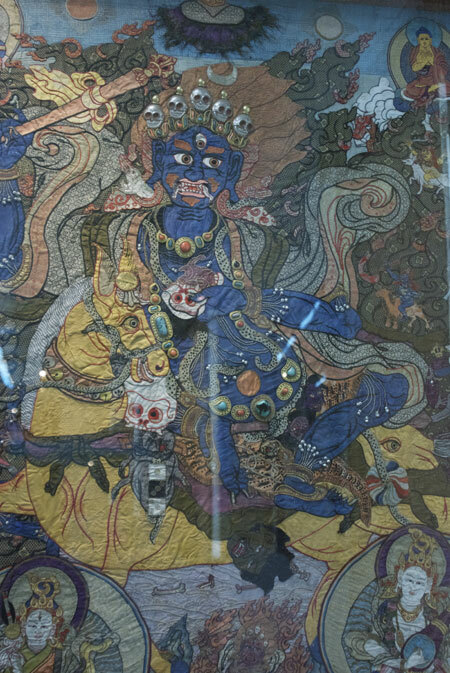 I did get some images of one of the incredible cloth applique thankas. I’ve done various kinds of embroidery for years and have never seen anything like this. The streak is a light reflection in the glass. And a closeup of the figure in the lower left hand corner. Downstairs at the museum is the Red Ger Art Gallery, where one can find contemporary Mongolian art for sale. We bought a couple of pieces of original calligraphy, including one that says “Chinggis Khan”. 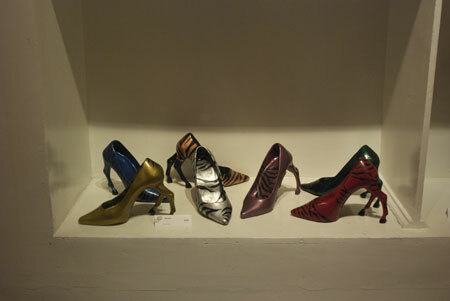 And then there were “the horse shoes”…..around $300 for the set. I did say that the Mongolians are a horse culture, didn’t I? So, before I commit an improper purpose I’ll sign off and hope to come back with tales of Hustai takhi. Back from Hustai National Park! 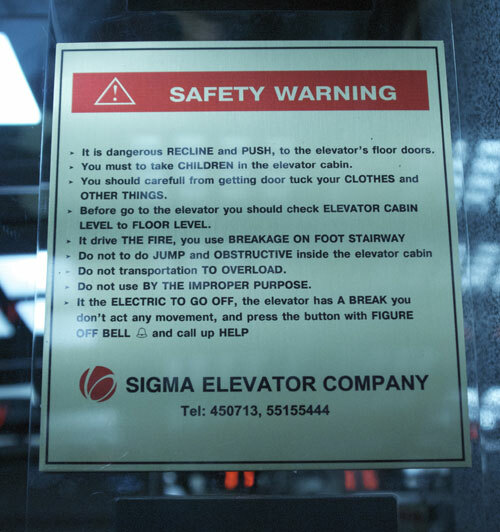 I love the elevator sign! Signs like this are one of my favorite photographic subjects when I travel, but I think this is one of the best I’ve seen. So glad you got to see the appliqué thangkas. I think the Mongolians have done some of the finest work in this medium and was honored to see many examples when they toured the US in 1996 for the exhibition “Mongolia: the Legacy of Chinggis Khan.” Beautiful. I haven’t made it over to Mongolia yet but am re-inspired to go by your post. My own appliqué thangka work can be seen at http://www.silkthangka.com. I trained with the Tibetans in Dharamsala, India. Please have a look! I look forward to reading more of your adventures. Wow, glad you made it. Thanks for the elevator pic. My friend who’s a mechanic for Otis Elevators will love it!